We are delighted to announce a new range of course badges that are set to recognise the achievements of The College of Animal Welfare (CAW) students who complete a number of accredited qualifications.The badges have been designed in response to requests from many of our Veterinary Care Assistant students, who wanted something to reflect their contribution to the veterinary team and make them identifiable to clients in their own right. The idea was so well received that we decided to produce a range of badges to recognise the achievements of CAW students across a number of different courses. A badge will be sent out to all new eligible students with their certificates. 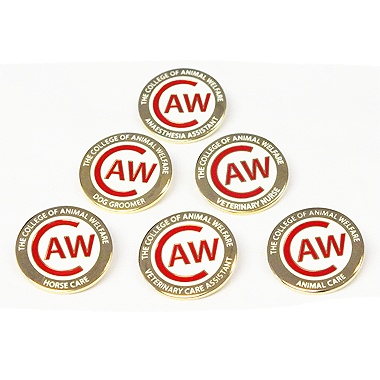 CAW students who have already achieved their qualification but would like a badge may purchase one from our online shop for just £5 including postage and packaging.